Origin and Habitat: Tamaulipas - nearby Miquihiuany to the north of San Luis Potosí - nearby La Inconada, North-Eastern Mexico (extent of occurrence is less than 5,000 km²). Altitude: 950-1200 metres above sea level. 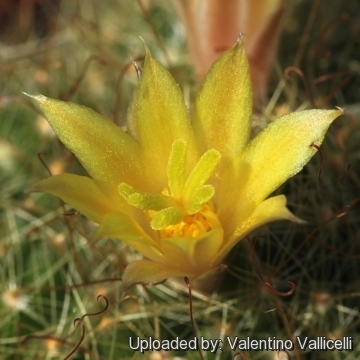 Habitat: Mammillaria surculosa occurs at low densities in severely disjunct subpopulations on lower slopes on calcareous soils in very sparse xerophytic shrubland along with Thelocactus tulensis, Mammillaria microthele, Neolloydia conoidea, Echinocereus pentalophus, Opuntia microdasys, Astrophytum myriostigma v. strongylogonum. It is rare and hard to find. There is also evidence of illegal trade and declining habitat quality, hence it is reasonable to say there is continuing decline. Overgrazing of the habitat by goats may also pose a threat. 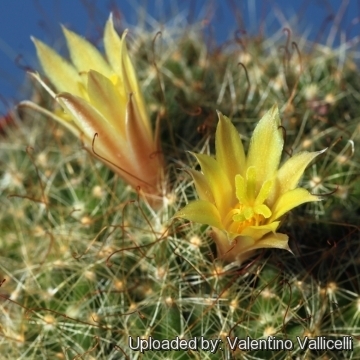 Ecology: The small heads of Mammillaria surculosa break off easily and attach to animal fur or feathers by means of the hooked central spine and then drop off later. These heads are spread to considerable distances by the animals, and can take root as they fall down to the ground, making them perfect for mass distribution via large areas. 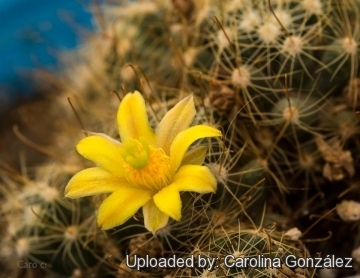 Description: Mammillaria surculosa (Syn: Dolichnthele surculosa) is a low-growing widely spreading cactus forming crowded mats or mounds of small heads and relatively large, bright yellow flowers. 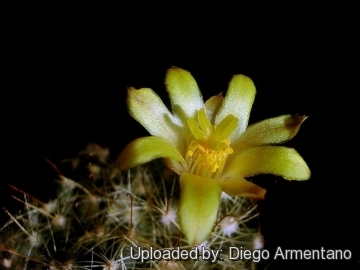 The most obvious characteristic for associating it with Dolichothele are the prominent tubercles and the comparatively larger yellow flowers than those of the average. Stems: Globose or elongate, spinous at the top, bright-green, to 1-3(-4) cm high and less than 2(-3) cm in diameter without milky sap. Tubercles: Prominent, softish, about 8 long and 4 mm in diameter, tapering cylindrical, rounded apically, without latex, axils naked. Central spine: One solitary, hooked, needle-like, slender, somewhat twisted, amber yellow or brownish-yellow, darker tipped, up to 20 mm long. 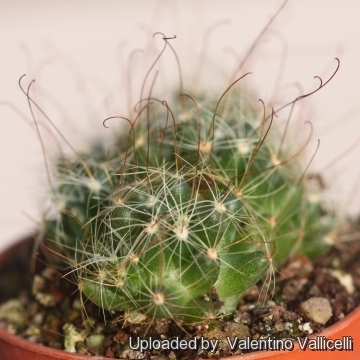 Radial spines: 12-15, white, 8-10 mm long, acicular, stiff , bristle-like, whitish to pale yellow, interlacing, flattened. Flowers: Funnelform, sulphur yellow, sweetly scented, not more than 2,5 cm long and approx. 18 mm in diameter at anthesis. 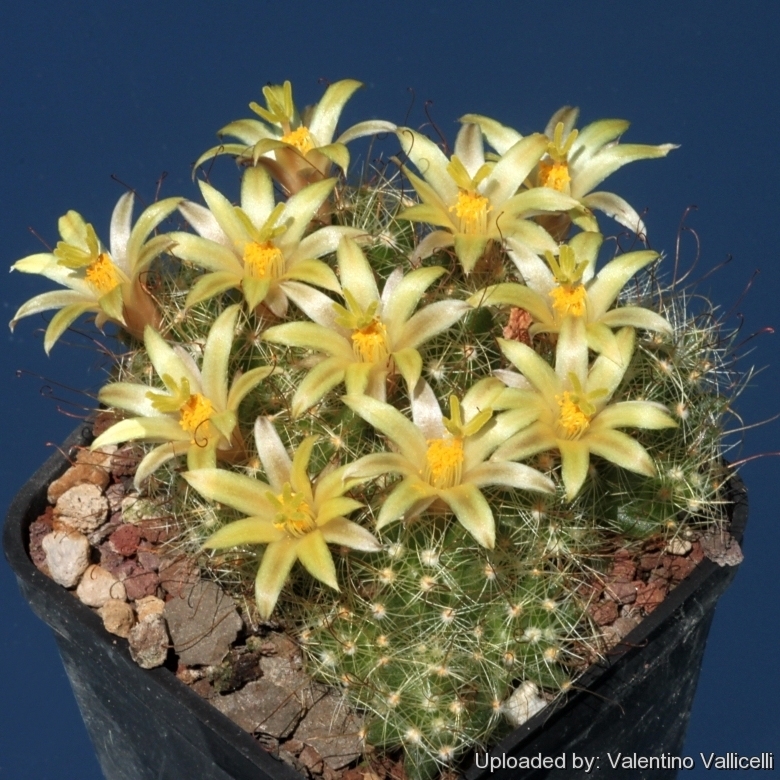 Tepals few, fused at the base, chrome-yellow with red tips and brownish-pink stripes on the backside. 13) Fitz Maurice, B, Sotomayor, M., Fitz Maurice, W.A. & Hernández, H.M. 2013. 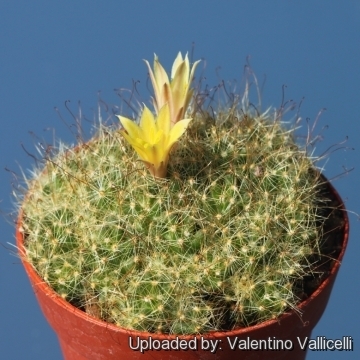 Mammillaria surculosa. In: IUCN 2013. "IUCN Red List of Threatened Species." Version 2013.2. <www.iucnredlist.org>. 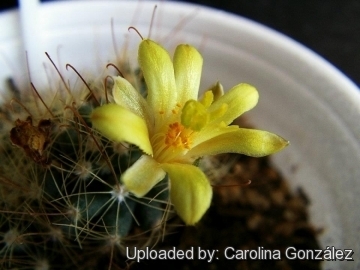 Downloaded on 01 January 2014. 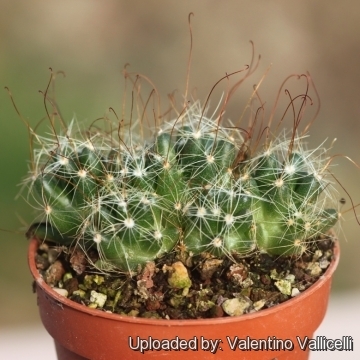 Cultivation and Propagation: Mammillaria surculosa is a freely clustering species that reproduces easily by cutting, recommended for any collection that needs lots of light with ample airflow.